In a BBC interview, Aisha Buhari suggested his government had been hijacked by only a "few people", who were behind presidential appointments. She said the president did not know most of the officials he had appointed. 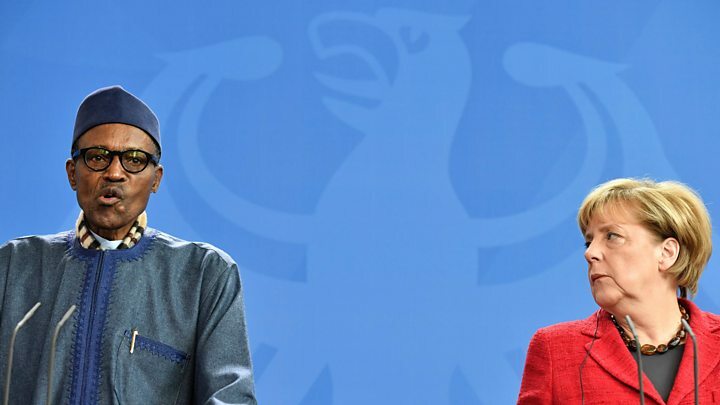 Mr Buhari, who is on a visit to Germany, has responded by saying his wife belonged in his kitchen. Standing alongside German Chancellor Angela Merkel at a news conference, the president laughed off his wife's accusations. "I don't know which party my wife belongs to, but she belongs to my kitchen and my living room and the other room," he said. The remarks earned him a glare from Chancellor Merkel. Mr Buhari said that having run for president three times and having succeeded the fourth, he could "claim superior knowledge over her". But in the interview with Naziru Mikailu from BBC Hausa, Mrs Buhari said: "The president does not know 45 out of 50 of the people he appointed and I don't know them either, despite being his wife of 27 years." "Some people are sitting down in their homes folding their arms only for them to be called to come and head an agency or a ministerial position," she said. Aisha Buhari campaigned vigorously for her husband in last year's election in Nigeria, organising town hall meetings with women's groups and youth organisations across the country. However, she kept a low profile at the start of the administration and was barely seen or heard. She was restricted to her work on the empowerment of women and helping victims of the Boko Haram conflict in the north-east of the country where she is from. This is one of the reasons why this damning interview has caught the attention of many Nigerians. It is a significant blow for Mr Buhari, who has a reputation for being a tough, no-nonsense president. Her comments also bolster accusations that his government has been hijacked by a small group of individuals. Critics say a large number of people have been appointed because of their relationship with those people in one way or the other. Mrs Buhari was prompted to to speak out in an effort to end those practices so that party loyalists who contributed to his election victory could benefit. Her critics say she is speaking out only because she failed to convince the president to appoint her own people. However, as the closest person to the president, she must have exhausted all avenues before criticising him in the media. The comments could also mark a turning point for a government that has clearly struggled to deal with economic recession and is facing growing disquiet within the ruling party. The Nigerian economy, battered by low global oil prices and a currency devaluation, officially entered recession in August for the first time in a decade. Oil sales account for 70% of government income. Born on 17 February 1971 in north-eastern Nigeria's Adamawa state, Aisha Buhari is the granddaughter of the nation's first Minister of Defence, Alhaji Muhammadu Ribadu. She married Muhammadu Buhari in 1989. They have five children together, a boy and four girls. In 1995 she opened the Hanzy Spa, northern Nigeria's first beauty parlour, in Kaduna State, after obtaining a diploma in beauty therapy from the Carlton Institute in the UK. She published the book The Essentials of Beauty Therapy: A Complete Guide for Beauty Specialists in 2014. She is an advocate of human rights and has donated money to help the families of victims of Boko Haram after more than 250 girls were kidnapped by the militant group in 2014. She caused upset in Nigeria last year after appearing in public wearing an expensive-looking watch, which led some to ask whether she was undermining Mr Buhari's "man of the people" image. Mrs Buhari was also criticised on social media for attempting to shake hands with the Alaafin of Oyo, a leading chief of the Yoruba people. 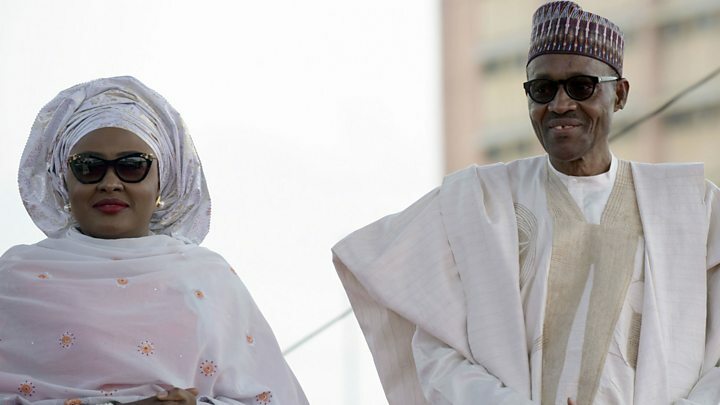 Mrs Buhari, who at 45, is 23 years her husband's junior, said he had not told her whether he would contest the 2019 election.